The Cambridge English Dictionary defines a litigator as someone who "specializes in taking legal action against people and organizations." A litigator addresses the big picture - the entire case from start to finish, not just the window of time that requires stepping into a courtroom to address judge, jury, and witnesses. A trial lawyer excels in the courtroom. In some larger firms, his role may be largely reserved for court appearances while someone else, typically a first-year associate or paralegal, handles the less exciting duties of case preparation. An editorial published by the American Bar Association calls trial lawyers "common folks' advocates" and characterizes them as street-smart and intuitive, but often lack the discipline and patience to deal with the more mundane details of every lawsuit. Trial lawyers often specialize in criminal cases and personal injury law. They may oversee a team of counsel who appears in court in complicated and high profile lawsuits. 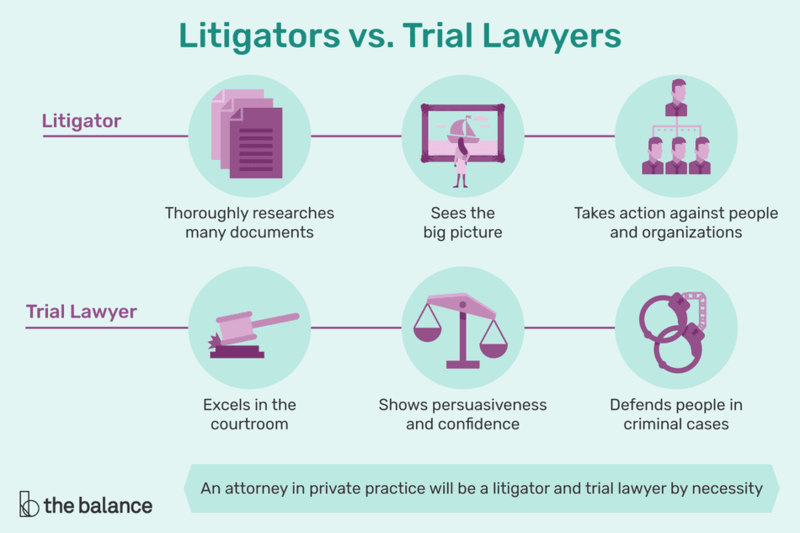 Attorneys who go into private practice and work as sole practitioners, they're the only lawyer on staff, are by necessity both litigators and trial attorneys. Managing a case from start to finish covers a lot of ground. It begins with a full investigation in most cases, a gathering of every minute detail that may ultimately affect the outcome. A "litigant" is the client a lawyer represents, and a litigator has an ethical and legal obligation to advocate for him to the best of his ability. The investigation aspect of a case often involves enlisting the help of other professionals, such as accountants or private investigators, and it may involve identifying and interviewing witnesses who possess important knowledge or information. A litigator initiates a case when the facts are known, incorporating them and his client's requests for relief - how he would like the judge or jury to rule - in pleadings that are then filed with the court. He may come into the case after a complaint has been filed to represent the defendant, the individual or entity being sued, or when the state has filed charges or is about to file charges in a criminal matter. An investigation continues in the form of "discovery" after a legal matter is initiated, an exchange of pertinent information between the parties to the case. A litigator then typically handles pretrial conferences and hearings, and possible settlement negotiations. Ultimately, if settlement fails, he appears in the courtroom for trial. If the case goes badly and he has grounds, he will file and handle an appeal. A choice between becoming a litigator or working as a trial attorney is often a matter of temperament. Someone who thrives on high stakes and the associated drama of trial may prefer to focus on becoming a trial lawyer, but it would necessitate the larger support staff commonly found in mega-firms and establishing a proven track record in court.